will the old names disappear? You land driving in France from the ferry or train. You are very likely to be on motorways for a good while as your first experience. Prepare! Think ahead. Food is probably better in the supermarkets than anything you bring with you. On secondary roads with one lane in either direction and without a central separator, that is most roads apart from dual carriageways and motorways, the speed limit has been reduced from 90 kph (56 mph) to 80 kph (50 mph). If the road has two lanes in one direction and one lane in the other, the two-lane direction is limited to 90 kph and the one-lane direction to 80 kph. Of course, as the maximum speed for heavy goods vehicles [poids lourds] is also 80 kph/, other vehicles now often have to break the law to overtake, else be stuck behind a dirty, view-blocking, often unstable HGV. Officially, this speed reduction is to help reduce road deaths, and is expected to save 400 deaths in a year. However, the general consensus is this speed reduction has been made to further fill government coffers. In the first month of this new regulation, July, over a quarter of a million more cars were flashed for speeding, over double the expected number. This is 2.1 times the usual numbers flashed. For foreign cars, the number flashed was up by 2.4 times. Remember, foreign drivers are a government's cash cow - often passing through on the way to, say, Spain, not knowing the country's laws, customs, language. Depending when you land, if you do not like giving money away to shysters, then have enough fuel to allow you to reach where you intend to first shop. The Channel ports all have supermarkets, but the northern retail centres [centres commerciaux] are usually somewhat seedy: OK for that quick dash across for the duty free, alright for a stop if you can afford the time and do not mind the hassle. Or you can plan ahead, carrying enough fuel to arrive at your first option further down the motorway, at a supermarket just outside a town next to the motorway. For road fuel prices in France. So to finding that vital, elusive supermarket stocked with cheaper fuel and decent food. You need to know the names of several of the main chains: Carrefour, LeClerc, Geant or Casino, Auchan, Super U, Intermarché, Champion; then look for their road signs. Almost every substantial town has a ring road, or rocade, often despoiled by vast human beehives for the poorer classes [habitations à loyer modéré or HLMs - modest rent housing], but enlivened with hoardings and large retail complexes There, the various huge stores live often alongside cafés, do-it-yourself [bricolage], garden centres [jardinier], many smaller shops and, of course, the cut-price service station. The French idea of signposting is rather slapdash and idiosyncratic, 5mn gauche [5 minutes left] or droit [right]. Well, it sort of depends on your speed, doesn't it, and do they mean on this road or turn right? Expect some navigational messing around 'til you locate the gold mine, not to mention ever-impatient drivers as you dither. Another favourite game is that when you want to turn left (across the oncoming traffic), you first have to turn right and then double back. Good hunting. Eventually you find the supermarket, not much different from the English chains, except often a great deal larger [called hypermarchés or grand surfaces] and with much wider range of goodies. They are somewhat cheaper than Britain, especially when the pound is relatively strong. As of late 2014, it is the euro that is still overvalued. Another wonder of French signposting concerns speed. The French government, helped by speed cameras, is now fining drivers left, right and everywhere to reduce fatal road accidents and, of course, make more money. Despite this, departmental and communal administrations prefer trying to instruct drivers to drive more slowly by signing. Here is one example seen on a road with a 110 kph speed limit. As you can see, by the relative sizes of the discs, these signs are well within 100 metres of the exit from the main road. I’m surprised that they haven’t put a radar trap here. Finding your way around towns often is not simple. You will often find yourself driving around in circles, trying to garner directions from them forriners who usually do not speak English too well. Of course, all the roads are the wrong way around, the road signs ain’t great, and the French cannot drive. No, they seriously cannot. France has twice the area of the whole UK to spread out about the same population, but until recently they still managed to kill twice as many people. The moment my wheels touch France, I drop my speed a full 10-15 mph. No, I’m not kidding! The French are not just dangerous drivers, they are widely and generally incompetent drivers. It is for this reason, and associated with the French problem of turning across oncoming traffic, there are more and more rond-points (roundabouts) and systèmes giratoires (multiple, connecting roundabouts, bridges and underpasses). Large numbers of French towns are very cramped , which can make parking a major problem, especially if you do not know your way around. Most French people drive around in tiny, little prams and the parking spaces are widely designed to accommodate that sort of vehicle. If you are going to hire a car and expect to spend a lot of time in towns, you should consider the possibility of booking a small hire car. By the way, the bizarre priority from the right rule still exists in France, a piece of Gallic logic created supposedly to regulate who goes first when two or more roads meet, except those which have the sign below, the driver emerging from the rightmost road at an intersection has the priority to go cross that intersection first, or even to turn onto another road. So, you may find a driver stops on a larger road to allow a car waiting on a side road (to the right of the main road) to turn onto the larger road. Also, French cars will surprise you by jumping out of side roads and onto roundabouts ahead of you, on the basis of having priority from the right [priorité à droite]. You should learn to recognise this sign. On roads with this sign, drivers have priority to when going across intersections or turning onto another road. There is also a version with a line through it, meaning “this road does not have priority”, that is cars coming from the right onto this road have the priority. surely a skull-and-crossbones would be more fitting! Roundabouts are generally exempt from this rule (cars should not just drive out onto the roundabout on the basis that they are to the right of cars already going round, although often they do) - note the cedez le passage/give way signs. 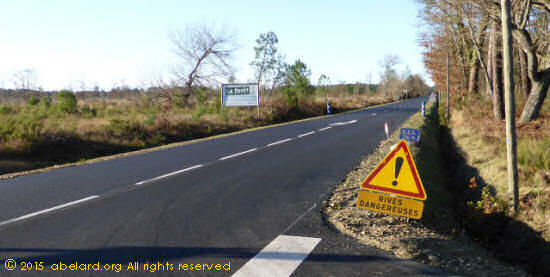 These mad priority signs, a positive clear sign telling you that idiots cannot jump out from your right and a negative sign (that has a cancelling line across) telling you that other drivers may jump out ahead of you, appear to have been developed by French bureaucrats attempting to correct the mess they had made previously with the generalised priority from the right rule. Even today, I have had a driver stop on a main road to let me out of a side road, with the usual screeching of brakes as others try to stop behind him; while still a considerable percentage regularly jump out onto roundabouts against oncoming traffic. Doubtless, the powers cannot admit to making this incredible foul-up, so I return you to my original advice: drop your speed in France and recognise that the French just cannot drive - assuming you want to live. Just to reassure you, it can become even more confusing. You may see one of these skull-and-cross bone signs with a number such as 400m in a block below the sign. It isn’t fully clear whether this means that the dreaded sign applies to the next four hundred metres, or it will apply in 400 metres time for who knows how long. Here, perhaps, you are expected to use your initiative. My response is to switch into double terrified mode and pray vigorously, without, of course, taking my eyes from drivers probably planning mayhem. The priorité à droite rule, known in English as ‘the nearside rule’, was adopted by the Paris International Automobile Convention in 1926, then confirmed in Geneva in 1949 and in Vienna in 1968. The priorité à droite rule started in Paris, instigated in 1910 by a Prefect of police, M. Lépine. Prior to this, the rules of priority on the road were very complicated, right of way being given according to the social rank of each passenger. Thus, it is said that passengers had to get off a coach to compare their titles and so decide who would pass first, according to the degrees of nobility! The Italians are mad, but good, drivers; the French are generally just stupid. The Spanish live somewhere in between! There is none of the habitual lane discipline you see in Britain; straying across the white lines is optional. As you are driving on the ‘other side’ of the road, you may well have an instinct to go the other way around a roundabout, or pull across to the now unfashionable side of the road. If you are unaccustomed to driving a continental, left-hand drive vehicle, you will have a great deal more to cope with on top of that. So, if you wanna live, drop your speed and drive much more defensively than most sane people drive, even than in Britain. Maybe this will start to change now, as even the French central government has had enough and is heavily cracking down on the situation. They are bringing in speed cameras , and are already becoming rather keen as it is realised how much money can be made from them. A whole raft of spot fines is now being enthusiastically applied for the most trivial and ‘creative’ infractions, for instance: 80€ for forgetting to turn off your fog lights. France is highly devolved, and so the local police get creative. A recent example was them lurking in a side road with a white line in a nearly deserted village and watching to make sure that the wheels of any emerging car completely stopped before proceeding - another nice little earner. If you are stopped, you’d better hope that the flic has his quota for the day, or is after bigger game. Another ‘creative’ infraction worthy of fining and deduction of points is not using the direction indicator when turning or overtaking, even on an almost empty dual carriageway, and turning on or off a roundabout. Because of this, the French will neurotically leave their indicator going when driving on the outer lanes of a motorway to show that they are still OVERTAKING, and then indicate when they are going back to the inside lane. Another French finickety neuroticism is only parking in spaces facing in the direction of travel. That will be another fifty euros, Monsieur - ker-ching. It is important to realise that people from abroad, or from another French department, are a delightful source of painless revenue, subsidising local taxes. On sunny days, during the tourist season, it is common to see gendarmes gathering like flies around roundabouts - so much better and more profitable than being cooped up indoors. While the motorways are generally of good standard, my impression is they have narrower lanes, but I’ve never checked. Once you are off the motorways, road quality varies considerably. France is much more decentralised than the UK, so every local commune [local authority] makes its own decisions. This means you can be tootling along a road with a good, well-kept surface and suddenly, without warning, the quality can drop dramatically as you move from one commune to another. Barrelling down a motorway, or even a minor road, one may suddenly be confronted by a fellow in a hard hat waving a red flag. Slam on the brakes, hope you don’t skid or the idiot behind doesn’t ram you - tailgating is a very popular hobby in France. Only to discover that that the man is, in fact, a metal robot with a moving, jointed arm, just there for decoration. It is not some panicking Frog signalling a major accident. A distinct aversion to cat's eyes (not invented here, or economising?) or white lines. This, of course, makes driving at night more difficult than it need be, especially when the narrow side road anonymously grades off into grass and then a ditch. Verges and deep ditches in shadow on a newly re-tarmacked main road. At the moment, there is one temporary sign warning of dangerous banks, but this danger continues right into the distance. This picture is in bright sunlight. However, in wet, gloomy conditions the contrast between road and verge is very poor. Ill-defined verges along a country side road, where the verges slope down to the ditches. The tyre marks of lorries can be seen in the muddy verge, as can the tarmac starting to break up on the border of road and verge as vehicles manoeuvre to pass one another. Note that as well as the border between road and verge not being marked, there is no central marking on this narrow road. 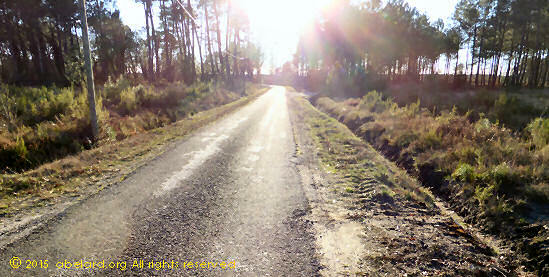 I have seen, on a large black and yellow roadside sign, absence de signalisation horizontale. In English – no horizontal signals, that is no white lines. It took me an age to work out what it meant. See how the white central dashes and white lines bordering the road peter out beyond the triangular sign. No, I’m not joking. Drop your speed at least 10 mph, and live longer. In France, you pay through the nose for most motorways [autoroutes] (there are a few free motorways, around large cities and in Northern France) but there is one great joy and luxury that comes with this cost – an immense variety of aires. Read more about the autoroute network and the more interesting aires in motorway aires, introduction, also accessible from the drop-down menu at the top of this page. The distance from Bordeaux to the Spanish border is about 120 miles/200 km. You drive on the A63. As crude oil prices fell in 2014, fuel prices went down 17.7% for gazole (diesel in English) and 14.9% for 95 octane petrol. Is this the real reason why the French government has jacked up the tax on fuels again, rather than the official line of reducing air pollution? From the 1st of January 2015, all vehicle fuel prices will increase by 2.4 centimes per litre (including TVA), an increase being termed as carbon tax. 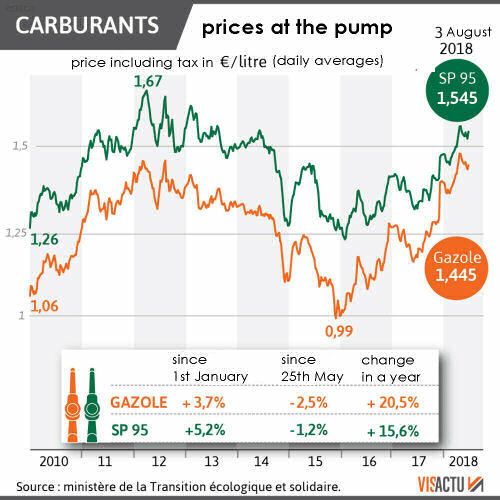 In addition, gazole will increase by a further 2 centimes per litre, making the total increase for gazole 4.4 centimes per litre. It is said that the additional portion of increased tax is to compensate for the collapse of the ecotax or environmental tax on trucks. The ecotax was to be charged on heavy goods vehicles [poids lourds - PL], the original plan being to register the movements of heavy goods vehicles on non-motorway roads, then send bills charged a per-kilometre road tax. 173 costly gantries with cameras had been erected to record the HGVs' movements, by detecting an obligatory black box installed in the lorry's cab. However, riots, road blocks and lorry go-slow demos [escargots - snails] on major roads during 2014 has forced the tax to be abandoned. Now the government is wary of upsetting commercial drivers further by targeting taxes solely at them. The government had been in a legal battle with the gantry constructors over cancelling their contract. This specified the constructors were to receive a portion of the revenue to be generated in payment for footing the construction bill. The conclusion of this battle is that the French government will be paying out 839 million € in all, 580-590 million € by February 2015, then 30 million € annually for 10 years. This agreement includes paying the salary for a year of the 220 white-collar employees made redundant, many of whom had taken out mortgages on the basis of an excellent, government-funded salary. However, this may not be the end of the story as far as the company concerned, Ecomouv, says their receipts would have been more like 2 billion € over 10 years. Update, February, 2015: The final amount to be repaid is just under a billion euro, at 958 million euro. Another reason why fuel prices will not drop to their current natural level. 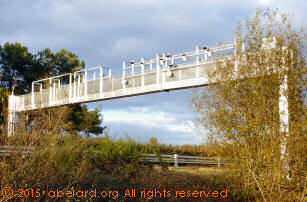 The ecology minister, Ségolène Royal (n° 3 in the government and ex-long term partner of unpopular President François Hollande) has proposed that these unsightly gantries now be used by the gendarmeries and customs (at further cost), rather than be dismantled at a suggested cost of between 7 to 13 million euro. Prices from French roadside and motorway service stations are higher than those at supermarkets. From late July 2017, the new Macron government created a very useful website showing the current fuel prices at service stations in each commune. This is done practically in real time, using the price declarations the service stations have to make to the government for tax purposes. As such, this website is a very useful aid for finding the best prices as you journey through the départements of France. Following the protests of the Gilets Jaunes (yellow safety waistcoats), the New Year's swingeing increase in fuel taxes has been cancelled. Now fuel prices reflect the contest between the general fall in crude oil prices and the grasping of resellers to hang onto profits. Note that the differential between supermarket and motorway fuel price varies over time. But if you drive on the tolled motorways, the tolls will cost you over 10 centimes a mile , approximately two-thirds the fuel cost, but see the update on autoroute tolls, January 2011. Because of the recent fuel price rises, motorway tolls are now a smaller proportion of the overall cost of motorway driving, though obviously, the monetary cost of going by motorway is always higher than travelling by main roads. Thus, driving on the tolled French motorways is somewhat a luxury. 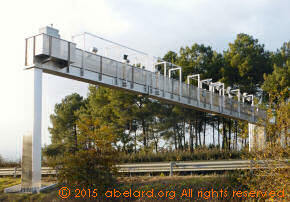 Some motorways are not tolled, especially around large cities and in northern France. However, driving long distances through France off-motorway can be very tiring and tiresome - winding through village after village, and cramped and crowded towns. There are long stretches where overtaking is difficult and lumbering lorries are routine. It can add much time to your journey, while not improving the nerves or the mood. To add to the fun, given the French standard of signing, in the larger towns without a bypass it is also all too easy to become lost, especially at night. While you will pay considerably more driving on motorways, with the steady speeds and more direct routes you may also have a 10-20% saving on fuel costs. Historic price information is held at end note 10 below for reference purposes. From 12 September 2018, the labelling of the pumps at fuel stations Europe-wide will change, 'thanks' to an European directive. French drivers will soon find no "unleaded 95" at the pump, nor "unleaded 98" or "diesel". From 12 October onwards, a single signing is being set up throughout the European Union and in neighbouring countries such as Norway, Iceland and Turkey as a consequence of a 2014 European directive. Round, square and rhombus: how does it work? 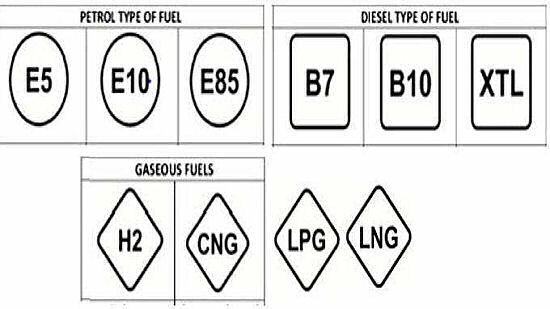 These new acronyms will be indicated on each of the fuel pumps as well as on the dispensing pistols, and also on new vehicles put on sale from this date. Each type of fuel is now represented by a shape: a circle for gasoline, a square for gazole (diesel) and a diamond for gaseous fuels. 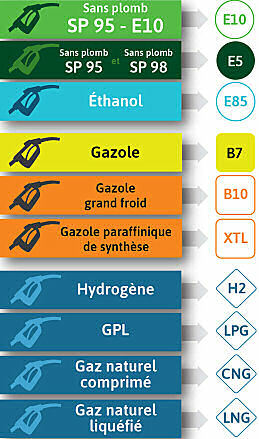 For diesel, motorists will have to get used to the letter "B", which announces the biofuel content: "B7" or "B10". "XTL" will soon designate synthetic diesel, not derived from oil. All the major distributors have already added the new labels to their pumps, but there may be some small independent distributors for which it will take a little more time. These new indicators will be present on new vehicles, near the fuel cap, as well as at service stations. But, insist the professionals, it will not replace the current labels, which are accustomed to motorists. "The new labels will complement the current indications on fuels, the pumps remain exactly as they are today, with yellow stickers for example for diesel. We will just add below the European standard", confirms Francis Pousse, National Council of the professions of the automobile (NFPC). "In no case is it the name of the fuels that changes". Taxing fossil fuels continues. Previously, taxes were increasing on diesel and falling on petrol. From 2018, they increase on both, but faster on diesel than on petrol, to align the two fuels' prices, it having been decreed that all diesel engines are more polluting than petrol ones. According to the calculations of the French Union of Petroleum Industries (UFIP), taxes on diesel could increase by 31 cents per litre by 2022, if the progress in the new finance law is fully implemented. For petrol, the increase will be 15 cents. This nice little earner punishes the many diesel vehicle drivers just not able to just buy a more expensive but apparently ecological, electric or hybrid car. The scrappage premiums are not realistic for the less well off, often living outside large towns, so dependant on individual transport. Since July 2018, when the speed limit on most secondary roads was reduced from 90 kph to 80 kph, the illusion of reducing pollution has been amplified. Cars are designed to have a cruising speed range where the car hums along, comfortable at the optimal rpm range and so giving the car's best fuel consumption. This cruising speed range was designed so the lower end of its range was near to the secondary road speed maximum - 90 kph. And what happens when the car is forced to drive at a lower speed? Fuel consumption increases, the car cannot produce sufficient heat to enable the catalytic converter, that converts carbon monoxide and other hydrocarbons into carbon dioxide and water, to work effectively. More pollution. Also see pre-route planning with GoogleMaps. Use a large road atlas, such as the one published by Michelin, for your preliminary trip planning. Once you have determined the general route, then use on-line planners which can give detailed information on distances, toll and fuel costs, and the location of speed cameras. For more local maps, use Institut Geographique National (IGN) Blue Series maps. IGN is the French equivalent of the Ordinance Survey in the United Kingdom. Blue Series maps are 1:25,000 or 1 cm to 250 metres. The maps can be bought in a local Presse/newspaper shop or supermarket. However, this is a little haphazard, especially for the high-scale versions, as these places usually only hold maps local to them. Mappy is an excellent, if slightly clumsy, on-line road planner. It also gives you the option of checking your toll costs for using motorways. Map24 is another online route-planning site, with several Java-powered interactive facilities. Although in French for the map of France, Map24 is mostly intuitive to use and can even be fun. It is possible to look at the map related to your chosen itinerary in various degrees of three dimensions [VUE 3-D], as if low-flying over the land. The amount of zoom can (almost too) easily be changed [ZOOM]; while when at least one intermediate way-point is specified, you can select which part of the journey to study [NAVIGATION]. Remember to prepare your car to be both legal and safe in France. 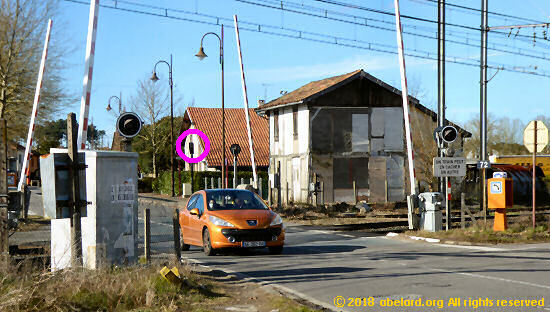 Not only does a driver have to make sure their car does not stall, or a cyclist that their wheels don't get stuck, there is a further traffic trap to be found at some level crossings (passage à niveau). In 2017, there were 15,405 level crossings on the national railway network - 0.4% were across national roads, 31.4% across departmental roads and 68.2% across municipal roads. Bearing these numbers in mind, there is a grand total of 80 level crossing cameras in France, that is one for every 192 crossings. A rare creature then, that is installed on what is called "priority crossings". The camera is very similar to those used with traffic (red) lights. The essential difference is the level crossing red flashing lights are synced to alternate with the camera flashes so each snapshot can highlight when the signal turned on. There is a safety delay, after which drivers who go across the crossing are flashed and fined (90€, and 4 points deducted for three years for holders of a French driving licence). and a second flash follows when the vehicle has continued their course at the crossing, whether on the railway line or when crossing the barrier line. In order to allow users to stop safely to comply with the flashing signalling, there is a safety delay, similar to the amber light for traffic lights, is set on the equipment. This delay is 3 seconds in built-up areas and 5 seconds outside built-up areas. It is only after this time that illegal crossings will trigger the radar flash. Note that for an average driver, from reacting to starting braking is 2.3 seconds. Some drivers take three seconds even to react, while a common reaction time of 1.5 seconds is often used in accident reconstructions. At least that time again is needed for the car to stop under braking. When driving at 50 kph (the maximum legal speed in towns), the reaction distance is just over 7.7 m or two car lengths, while the braking distance is over 15 m or four car lengths, the total average stopping distance being 23 m or 6 car lengths. This is not good when you are being followed by the typical French tailgater. Clearly, someone is more interested in money than common sense. From Monday 14th September 2015, a new generation of speed cameras is coming into full service, with fines being issued to vehicles flashed. The camera must be positioned to one side of a road, at car level. The three windows are larger. Top left box - the flash, top right - the two cameras, bottom left - the radar. Looking into the top right box, there are two cameras. The new cameras photograph both front and rear number plates. One version of the cameras photographs one car two times - as it approaches the camera and then again as it goes past and away (there is little further information available on these cameras). In the other option, the cameras photo the number plates of approaching cars in one lane, as well as those of cars going away on the further lane of a two-lane road. Camera flashes in one direction Same camera flashing for other direction. Regarding the first type of two-direction camera, the justification for photographing a car's registration twice is that 38% of photographs are legible, so this will double the chances of having a usable photo. It also means that the authorities can have a photo of the driver's face, which could help in cases when the car's legal owner was not the offending driver. For the cameras that will photo cars on either lane of a two-lane road, it doubles the number of possible finable victims. These cameras can only be mounted at one side of a road, at ground level. They do not function on gantries, nor in the centre of a dual carriageway road or motorway, not on a pole (like traffic light camera installations). Kindly, "information panels are systematically installed" in each direction on the roads controlled by such equipment. And they are different to the current warning information panels. So when you see a new-type sign, you will look at both road sides to spot the camera. In all, 111 cameras will being put into service now. This will increase to 200 by the end of 2015, and a further 500 is expected in 2016. Many of the cameras are existing cameras that are having their software up-graded. As a result, the cost of the new system is reported to be 'only' 15,000 €. These cameras are being introduced now because the number of deaths on the roads is increasing again. However, only a quarter of fatal road accidents are caused by "excess speed", so these cameras appear to be more jackpot-paying slot machines (machines à sous) than accident-prevention devices. A French driving magazine has done some research, and found that 52% of speed cameras are not put in accident-prone zones. Why? Well, they do not make as much money. Cameras in accident-prone zones only flash 4,774 times in a year, while those in non-accident prone zones flash 12,000 times. 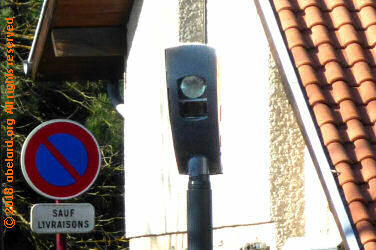 There are over 9 million automatic road cameras operating in France. When a vehicle is flashed, the traffic control computer systems have to co-ordinate with other data systems holding driver's and vehicle details in order to be able to fine and deduct points. According to a government report, 46% of offenders have no points deducted. If a person is driving a company car, the company most often pays the fine. There is a 12% likelihood that later the driver will be billed. Lastly, a good percentage of cases fail for 'technical' reasons. Mind you, it's still a good thing to drive at a moderate speed, both for your nerves and for helping to minimise carbon dioxide emissions! From today, all radar alerters and GPS systems, like TomTom, that can alert the user to an approaching speed camera, must have been updated to indicate “Danger Zones”, rather than individual cameras. The fine for using such a machine that has not been updated is 1,500 € and the loss of 6 points from your driving licence. where there have been several accidents before. 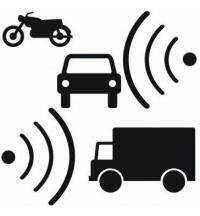 Until your GPS is up to date, disable the radar camera detection facility. Then you can update your GPS software later. If you are stopped by the police or gendarmes, you must be able to present a certificate that you machine has been updated, otherwise it will be considered to be a radar detector and you will be liable to that 1,500 € fine and 6-point removal. For information concerning TomTom [English translation of French TomTom web page]. For Garmin users, “on their website, customers are encouraged to update their GPS for free”. But ‘danger zones’ are being chosen by the Préfet of individual departments and so can be pretty arbitrary. It is said that they are increasing by 50 or more a month. The removal of warning signs will go ahead. This now superseded, see 09.04.12 update above, so radar locators may not be used, even just as additional speed indicators . GPS gizmos may be used provided they have been updated to show ‘danger zones’ rather than radar cameras. 1,000 ‘educational’ detectors to be installed. Near the speed detectors will be a large sign indicating the speed of the car just timed to make drivers aware of their speed. As yet, there are no fines associated with these signs. There are now also ‘educational’ speed signs that show only your speed. These signs are often on dual carriageways or other trunk roads. 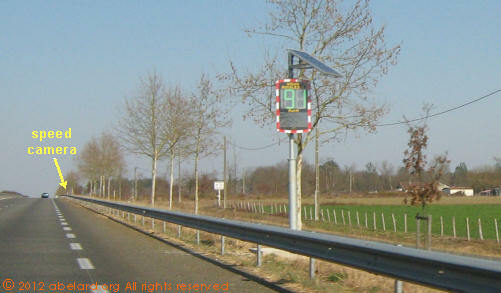 Speed indicator powered by a photo-voltaic panel. The speed indicated is very unreliable. In this case, the speed being driven was about 75 kph. Note that sometimes there is a speed camera not long after the speed sign. Heaven knows whether speed cameras are just as unreliable. As well as these immediate speed detectors and cameras, there are also being installed measured-distance speed radar systems that flash up a driver's car registration number and the words TROP VITE! (too fast). 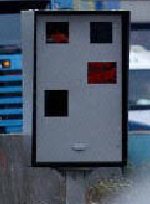 So far, these gantry signs are operated by the motorway concessionaires, for "the drivers' education". It is expected, later in 2016, that government-controlled distance/time speed detectors will start to be introduced, with associated fining capabilities. 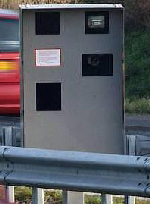 It is unclear whether these speed detectors will inform drivers that their speed has been recorded. It's all part of driver intimidation. 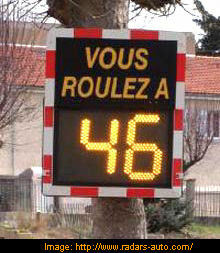 It is being announced in French newspapers, by September 2011, many new rules proposed to penalise bad drivers. These new strictures, no doubt, would help Nicholas Sarkozy in the run up to the next Presidential election in 2012, while much increased fines would help the French Treasury, which like so many others is suffering in the current financial malaise. A greater constraint on speeding will also control fuel consumption. Signs forewarning of radar cameras to be removed from the roadside, whether for fixed or mobile cameras. Also, by the end of 2012, a further 1,000 radars are to be deployed, including 3rd-generation mobile radars operated from cars that are travelling amongst the traffic on the road. Gadgets warning of radar locations to be banned, such as those made by Coyote, Wikango or Inforad, although it is unclear how this will apply to GPS that also give radar alerts. The government no longer to publish maps of camera locations. Fines for speeds in excess of 50 kph above the speed limit to incur a heavy fine (3750€), a possible prison sentence and a loss of 6 points. Using mobile phones to be illegal while driving, though hands-free kits will still be allowed. Stopping on the hard shoulder (the bande d’urgence) now forbidden, attracting a 135€ fine. And don’t forget that wearing a fluorescent waistcoat is now mandatory if you are on the roadside outside your car. 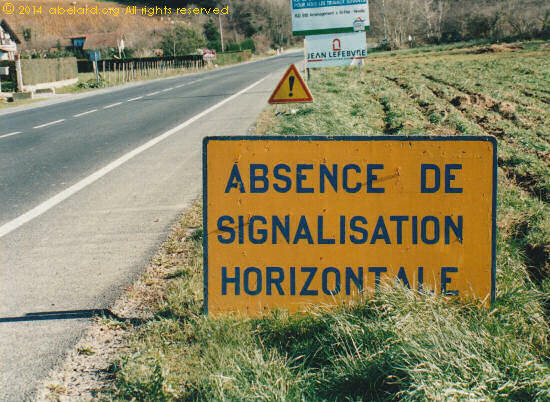 During 2006, the frequent contradictory, badly placed road signs have even come to the notice of the French TV news and the government. Now it is official, you can expect to see consecutively speed signs of 70kph, 90kph, 50kph within a few hundred metres/yards of each other. Although we had been informed that the large prominent signs (below) would be removed progressively, this did not happen, so drivers should still keep a look out on seeing such a sign. Although the location of each speed camera is no longer identified by the French government on their web sites/maps, information can be. If you generate an itinerary using Mappy, it will locate (approximately) where there are any speed cameras on your route. However, although the warning sign is prominent, the camera that follows is often placed discretely - under a bridge, behind a road barrier, near a roadside planting. Also be aware that French fixed cameras are not set on high supports as in the UK, but are attached to a short support near the ground. 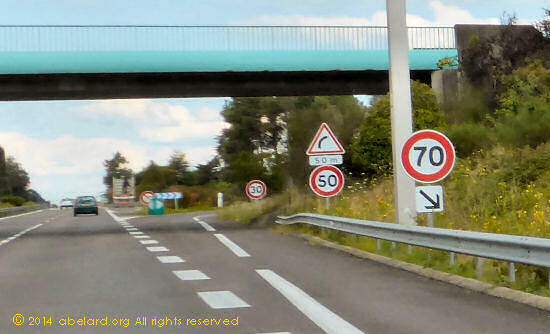 There is no reason in France to receive a speeding ticket from a fixed camera, the signs like that photographed above are very prominent and usually several hundred yards before the camera - see a sign and make damn sure your speed is comfortably below the local speed limit. You can even take pleasure in watching the cars rushing past who are then flashed by the camera. As well as the 1,000 fixed cameras on French roads, installed since October 2003, there are also many mobile cameras used by gendarmes. These may be set up at the roadside, or looking out from the back of a police estate car. These cameras should also be signed by a smaller, mobile warning sign. Remember les flics are out to meet targets and to make money. Therefore, they may ‘forget’ to put out the sign. 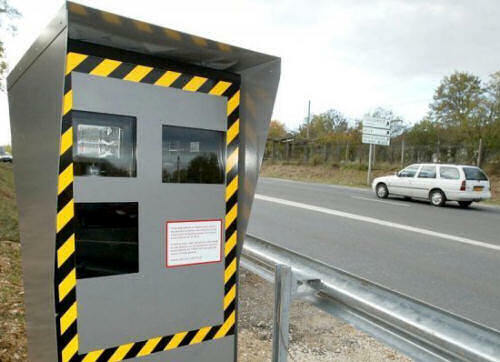 French speed cameras send two photos and accompanying data to a central processing point that, after assessment that the driver was speeding, automatically sends out the paperwork demanding the fine. Fines are on sliding scales, depending how much above the local speed limit the car was going. Be aware also, that the fines are accompanied by a deduction of one or more points from the driving licence, again on a sliding scale. If you receive such a demand, it has to be paid first (with the amount doubling if there is delay) and any dispute can be made later. However, as a foreign visitor, you may well escape paying a fine, unless you are caught by a roadside gendarme who demands an immediate fine, or unless your car is registered in another European Union country that has a bilateral agreement. For town speed limits, the delimiter is the town name plaque. On leaving the town there is another plaque with a black diagonal line through the name. This marks the return to the open road speed limit. In some villages, the speed limit goes right down to 30 km/h, or even 20 km/h. Euroland is gradually moving to reciprocal recognition and shared data record storage of car registration. The first countries that are moving towards such arrangements are Germany, Holland, Spain. This situation will be complete when the proposed European driving licence is in place. April 2010: Permission has been given for a further 3,000 surveillance cameras to be installed in towns. The French police are using them to watch for ‘bad’ actions by drivers, in particular stopping or parking in illegal locations. As towns become more crowded with traffic and parking is often reduced to provide more pedestrianised areas, finding somewhere to stop is becoming more irksome. Note that fines can be 2000€ or more. From the beginning of 2017, a new requirement will roll out to reduce air pollution caused by cars - the older ones and, particularly, those with diesel engines. Drivers will display Crit'Air stickers to show how much the car pollutes, the different colours on the stickers indicating the level of pollution (the most polluting cars have no sticker). Although this requirement is as yet voluntary, cities with considerable pollution problems are demanding the stickers sooner, particularly Paris, Lyon, and Grenoble. Air pollution, in particular from fine particulates and nitrogen oxide, is blamed for 2,500 deaths a year in Paris and 5,500 across France, higher numbers are also quoted. The Crit'Air stickers, costing 3.60€ plus postage (total: 4.80€) are available from a government website (in English). The application is spread over several pages, requiring full details of the vehicle's registration and a copy of the up-to-date registration certificate. The certificate has to be uploaded as a .pdf, .png or .jpeg format file, less than 400kB in size. Note that after ordering, the sticker can take 6 weeks to arrive in the UK. However, French officials say that showing a printed copy of the email confirming the purchase of a sticker will be sufficient to show to police if the car is stopped. The different categories are divided into petrol [essence] and diesel cars, and then when the car was first immatriculated (given an number plate). "Paris is entering a new phase in its pollution control plan: from 15 January 2017, it will become the first Restricted Area (ZCR) in France. Vehicles circulating in Paris must be equipped with an air quality certificate, "Crit'Air", established by the Ministry of Ecology and Sustainable Development, that is to say a sticker indicating their Level of pollution. "All vehicles are concerned without exception including those of disabled people and foreign vehicles." All cars, vans, motorbikes and lorries entering Paris proper, the periphérique (the major ring road around Paris) and the Bois not being concerned, between 8.00 and 20.00 Monday to Friday, must have a Crit'Air sticker. If not, the driver is liable to be fined up to €65 for cars and €135 for lorries. There is no exception for foreign cars, even if just passing through Paris on the way to somewhere else. This in addition to lorries, coaches and buses registered before1st October 2001, petrol and diesel cars registered before 31st December 1996, and motor bikes and similarly engined vehicles registered before 31st May 2000 being banned all together. 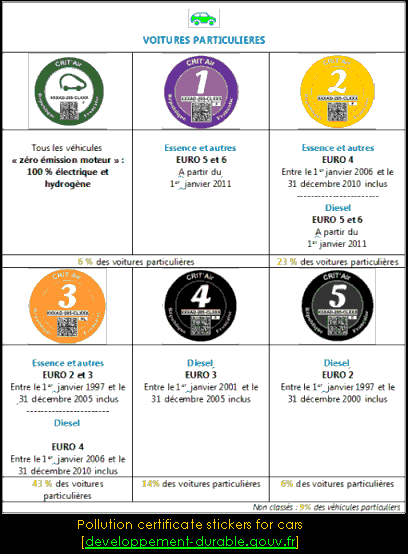 As of 1 July 2017, the traffic ban will apply to diesel and light commercial vehicles with a Euro 2 sticker (put into service before 1 January 2001 - no new prohibition for petrol vehicles before that date) and heavy goods vehicles Euros 3 sticker (registered before 1 October 2006). Make sure that your car is in a good state when you come to France; From May 2018, the French M.O.T. is becoming much more strict as the result of an EUSSR edict. Although, foreign cars do not have to submit to a French M.O.T., gendarmes can be expected, when stopping foreign cars, to take advantage of the new regulations to help reach their targets for collecting fines. This website (in French, but pretty intuitive to use) provides comparative fuel prices for each department, or towns within a department, as well as price on each motorway [autoroute]. It also indicates the price movements. Based on approximately 45 miles per gallon, or 10 miles per litre. 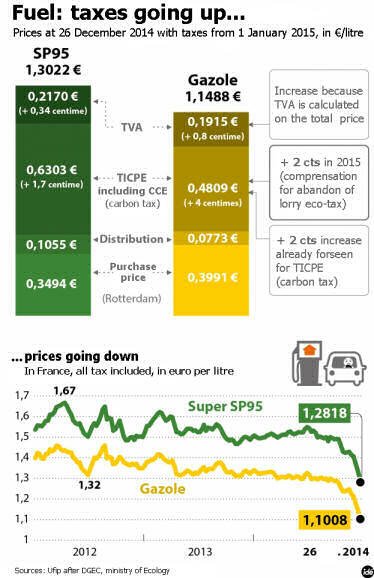 Breakdown of vehicle fuel prices after 1 January, 2015 (translated from diagram at francebleu.fr). Motorway tolls are often being raised, amounting to roughly an additional 50% in recent years. Because tolls cost nearly as much as the fuel you will use on the motorway section of your journey, your travel expenditure on motorways can be almost as much as double the amount you paid at the pump. Note that increases in fuel prices are now (2011) running ahead of toll price increases, so tolls will not be such a large proportion of autoroute driving costs, though those have increased widely during 2010-2011. Remember, the difference will change according to the current exchange rate. During a French driving lesson, a yak was told to slow down to a virtual halt at every side road on the right that did not have a white painted line across it (the indication that drivers on the side road must stop before moving onto the more important road). Having slowed down, the yak had to look right, up the side road, to make sure that there was no car there about to require to be let out before the yak could advance. Here is a page with links to maps of automatic radar positions in France generally, and in the Paris region, together with a verbal list of the positions, and more are being placed all the time. There is also a FAQ (in French). Mappy, the online route calculator, as well as giving the motorway toll charges, shows fixed radar camera positions on the calculated itineraries. There are also hand-held and vehicle-mounted versions in use, which the government map and Mappy cannot show. The government are also introducing technology to nab you for travelling too close (less than 2 seconds gap). Petrol is, approximately, the same price as in the UK, but diesel is, approximately, 25% cheaper. Well, it is from the supermarkets. Buying fuel from supermarkets is approximately 15-20% cheaper than on the motorways. You will save, perhaps, the equivalent of up to 1p per mile if you use supermarket petrol, and with diesel you can save most of 3p per mile compared to the UK [prices during July 2004]. But if you drive on the tolled motorways, the tolls will cost you approximately 8p a mile (about the same as the fuel cost). • At least one reflective, high visibility (dayglo) waistcoat, kept easily accessible in the occupants' part of the vehicle, not in the boot (trunk). Sensibly, you would have one for each occupant. Often, they clothe the seat backs for easy access. 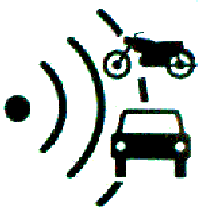 • A reflective warning triangle, to be put out about 30 metres from the car (or more, if necessary). It is obligatory to use the triangle on the motorway, except if doing so might put the driver's life in danger. If you aren't sure, don't - putting it out near racing cars and lorries is too dangerous. (Yes, contradiction is common in French law.) Wait behind the autoroute safety barrier, away from your car. Turn on the hazard warning lights if they are available. • Note, this has now been cancelled. It really was a ridiculous law. However, we are leaving the information as a reminder of how French bureaucracy overpowers common sense. "at least one breathalyser kit". However, the Highway Code does recommend that for drivers who choose the disposable breathalyzer, it is advisable to be in possession of two breathalyser tests: one to test and a back-up". The kits must be “unexpired, unused and in accordance with NF” [French official norms]. There are two types of kit: the expensive [100 € or more], electronic kit which is reusable; and the cheap [1 to 3 €], throwaway, chemical kit. In France, one of the places to buy these is in the local pharmacy. Cars and other vehicles with two or more wheels (mopeds, 50cc or less, are excluded) will be checked before they even hit French roads, with random checks in the Channel Tunnel and on cross-channel ferries. Since 2006, drink-driving has been the greatest cause of the over 4,000 road deaths a year, greater even than those caused by speeding. Drink resulted in nearly a third of road deaths, a number "virtually unchanged for 10 years" and "far superior" to England (17%) or Germany (10%), with similar levels of alcohol consumption. Since it is illegal to drive in France with any dud lighting, a complete set of bulbs is a sensible addition, as well as making sure that you still have the vehicle's user manual to help in changing the lights. But note, large numbers of French vehicles do not have all their lights functioning. You must also redirect your headlights so they point away from oncoming traffic, which will be approaching towards the left of the driver instead of the right. Plastic 'headlight redirectors' are easily obtainable from car accessory or motorway shops. They are a little tricky to put on correctly the first time, so take your time and check the instructions and your result. If you buy fairly solid 'headlight redirectors', you can remove and save them for next time you visit the continent. Electricians' insulating tape is effective for re-taping the plastic to your headlights. The tape is waterproof and so will keep sticking through French summer thunderstorms. And do not forget that you must have your papers - passport, driving license, international insurance, car registration document (called la carte grise in France) with you, close to hand, when you drive. If stopped, these are what the traffic gendarmes will ask for first. It is also required that you have your identification documents with you when you go out in France. Note that these are details for the spiral bound version of the atlas. There other, non-spiralbound versions available. Americans may decide to wait to purchase a road atlas, if they need one, once they have arrived in Europe. The instructions on each succeeding page are in English and easy to follow. Note that postage is currently 4.70€ (the UK is classed as a EU country �near to or with a border with France�). AA index page for monthly fuel price reports. Fuel price report archive 2000 - 2010. Although frowned on by the flic and finable, on country roads outside villages a common solution is to have the front fog lights lit. These have a wider sideways spread than dipped heads, and in combination, make unmarked, unlit side roads flanked by ditches a much safer proposition. "A ZCR is created by a local by-law. This needs to be justified by an environmental study to make an inventory and assess the expected reduction of pollutant emissions. It shall be submitted to the mobility organizing authorities in the areas concerned and their surroundings for advice, to the municipal councils of the adjoining municipalities, to the road managers and to the consular chambers concerned.